Ocean Front! 2 Bd + 2 Bunk! Clean! Walk to Pier Park! Beach Chairs! Condo, 2 Bedrooms + Bunk Area, 2 Baths, (Sleeps 6) Newly decorated Dec 2015. This is the best 2 bedroom condo available in Aqua. Huge set of double glass living room doors with unrestricted Gulf of Mexico views. Well appointed and easy access to all that Aqua offers and fantastic ocean front views. * No service fees or emenity fees. All pools are open and business is back to usual after Hurricane Michael. PLEASE CHECK CALENDAR FIRST - IT IS ACCURATE AND UPDATED DAILY. Summer schedule (Late May to Mid August) is Saturday to Saturday bookings only. Thank you. Best of the Best in PCB! Luxury Beach Front Condo! We have prepared all for a beautiful and cozy stay! Not only do you have the best breathtaking views of the Gulf, we have made sure that even your sleep is the most comfortable! Minimum age for rental is 25 no exceptions. My Aqua Unit is located on the third floor which is conveniently located on the same level as the bridge which connects the parking garage to the condos. You will never have to wait in line for the elevator. Elevator lines can be extremely long during peak season. Our location is the most convenient in Aqua. Condo's close to the parking and beach are premium condo's while those higher have less demand due to long elevator wait times. We supply complimentary Beach Chair Service - Includes 2 Beach Chairs with Umbrella! Wi-Fi Access Included! We would love to have you as guest. No resort fee !!! 2 Bedroom, 2 Bath, and Bunk Room! Exquisite interior spaces include an elegant master suite with a separate glass enclosed shower, double vanity, kitchen with granite counter tops, refrigerator with ice maker, microwave, and laundry with washer and dryer. Our floor plan is the largest 2 bedroom floor plan available in Aqua. Huge living room with two sliding doors which lead to a beautiful balcony and spectacular views! We do not charge resort fee's and our cleaning fee is what we pay. ALL RATES ARE QUOTABLE DIRECTLY FROM VRBO WEB SITE AND RATE SECTION. Overall, we have set this unit up the way we would want to vacation. We feel most confident that you and your family and friends will enjoy and find Aqua to be best of the best in PCB as well! Welcome!!! Aqua is the newest and most upscale of recent developments built in Panama City Beach! Aqua commands one of the most enchanting views on the gulf coast as this beautiful property rises above the white sands of Panama City Beach to the vibrant blue of the Gulf Coast sky. Sandy white beaches and blue-green crystalline waters stretch as far as the eye can see. Experience the poolside café, the whirlpool spa and the majestic beachside terrace of pools, fountains and water gardens - Aqua is your ultimate Gulf-front vista, all the beauty of resort living and all the comfort of home. Vacation pleasures abound as there is championship golf, fine restaurants, spectacular shopping, sport fishing, scuba diving, parasailing and amusement parks…or just make new tracks in the sand. Whatever you choose, Aqua is both your enchanting host and your luxurious sanctuary. While at Aqua you can enjoy on-site pampering services such as Aromatherapy Steam and Massage Treatment Rooms, Fitness Center, supervised Kid's Club during peak vacation seasons, Poolside Party, Meeting and Media Room, an Event Center and more. Aqua is just a pleasant stroll away from the newly developed Pier Park, a 240-acre high-energy entertainment, dining and retail wonder for the whole family. Pier Park is a unique open-air regional retail environment providing shopping, entertainment, and dining experiences. Accessories on the Boardwalk, Marble Slab Creamery, Aéropostale, Jimmy Buffet's Margaritaville, Tootsies, Massage Envy, Merle Norman Cosmetics Studios, Beach Scene, Zoom Tan, Victoria Secret's, Fusion clothing store, Old Navy, PacSun, Panera Bread, BORDERS, Payless ShoeSource, Buffalo Wild Wings, Quizno's Subs, Caché, Red Brick Pizza, Reggae J's Island Grill Candy Maker, Ron Jon Surf Shop, Carlyle & Co., Smoothie King, Crocs, Solace Salon and Day Spa - Aveda Del Sol, Aqua Gallery, As Seen on TV, Bath and Body Works, Chico's, Claire's, Justice, Dillard's, Starbucks Coffee Company, Sunglass Hut, World Fish Tales, SUNSIGHTS by Solstice, Five Guys Famous Hamburgers & Fries, Target, GNC, Back Porch Seafood and Oyster Bar, The Grande 16 Theatre, Hofbrau Beer Garden, The Walking Company, Hollister Co., Tilly's, Jake at the Beach, Trader Tom's Shells & Gifts, JCPenney, Jos. A. Bank, Unique Boutique by Irene & Co., Kilwin's Chocolates & Ice Cream, Verizon Wireless, Lane Bryant, Ulta Cosmetics, Yankee Candle, Longhorn Steakhouse and more! • Hombre - Aqua is within five minutes of Hombre, Panama City’s premiere championship golf course. Hombre is made up of 27 holes and is the annual host of the PGA Tour Qualifying School. • Bay Point Marriott Resort – Bay Point is home to not just one but two of the most spectacular 18-hole golf courses along the Emerald Coast and Florida Panhandle. The recently renovated Meadows Course continues to be a popular choice, along with the Nicklaus Design Course which opened in the Fall 2006. • Windswept Dunes Golf Course – Located approximately 15 minutes from Panama City Beach. Voted #5 in the Top Ten Courses you can play by Golf Magazine! Unique dune-lined course meandering through 700+ peaceful acres. Massive fairways are a beautiful contrast of emerald green against the dunes and native vegetation. We love PCB and think Aqua is the best of the best! It is very convenient to lots of great shopping and dining at Pier Park and other local spots! 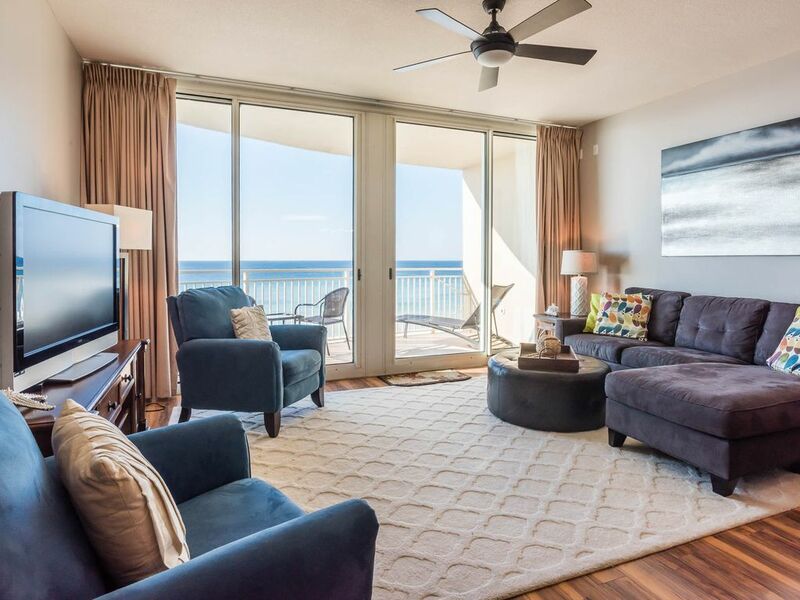 It truly is the ideal condominium in PCB. Aqua is the premiere building in Panama City Beach. We had an excellent stay. Communication was great and easy!! The Condo is in excellent condition and you couldn’t ask for a better location. Definitely will book again! Wonderful place to stay! The condominium is laid out perfect with an incredible view. We had a great experience staying at the Aqua condominiums. The pool and hot tub area was clean and friendly. Great location for dining and shopping. Our condo felt like home. Nice location! Pool area is very nice! Would stay here again. The view is perfect even from the dining area and kitchen. The beachfront is very near the balcony. Rene's condominium is nicely decorated and well kept. The bed's mattress is comfortable. We always travel with our own pillows. The bathroom is roomy with the double sinks. The oven and refrigerator look new, and the counter space is more than adequate. The dining table is spacious and the living room furniture is very comfortable especially the chaise lounge sofa. We did not get a chance to use the other facilities in the building, but found the venue to be pleasing. Being able to park the car on the same level as the condominium and to never have to use the elevator to get to your car was very convenient. This was our first VRBO vacation experience and we made a great choice staying in Rene's condominium in PCB. Thank you so much for picking our condo. We certainly hope you will come back in the near future. Thank you for your review. I will certainly order more balcony chairs ASAP. We have two chairs plus a lounger. I’m looking forward to seeing you back soon. Pier Park, located directly across the street, is a major entertainment and retail development with movie theaters, many restaurants, major retail, specialty shops and other entertainment venues. Also, guests of Aqua receive discounted rates at Hombre, Panama City Beach's premier championship golf course, which is located within five minutes of the property.